It’s one of my favourite memories from when I was a kid, and I remember the day before as much as the day itself. The day was pretty cool, especially feeling all grown up and having my relatives all come and make a huge fuss of me. But the day before I felt pure joy. As my parents cleaned and tidied and organised food for the post-Mass party, I pushed myself as high as I could on our backyard swing and sang with absolute conviction the hymn we’d been taught by our teacher for the day. “Today’s my day, a very special day for me. For like little children all over the world, I’m going to meet my Lord. So, join together and sing and pray. We’ve just celebrated our second daughter’s First Holy Communion. For both of our big girls we’ve prayed a novena, a different short prayer each night in the nine days leading up to the big day itself. I think we’ll use it for our boys as well, it’s a nice tradition and very low-effort which suits us! I pinched our First Holy Communion novena from this website, Whispers of the Soul. The dress, veil, and hair has all been very important of course (looking forward to the boys being a lot simpler in that respect). Gifts include the obligatory rosary beads, prayer books, and little plaques (noticing a lot of cash is being given these days, not sure what that’s about). We also include the extended family and godparents on the day as well. 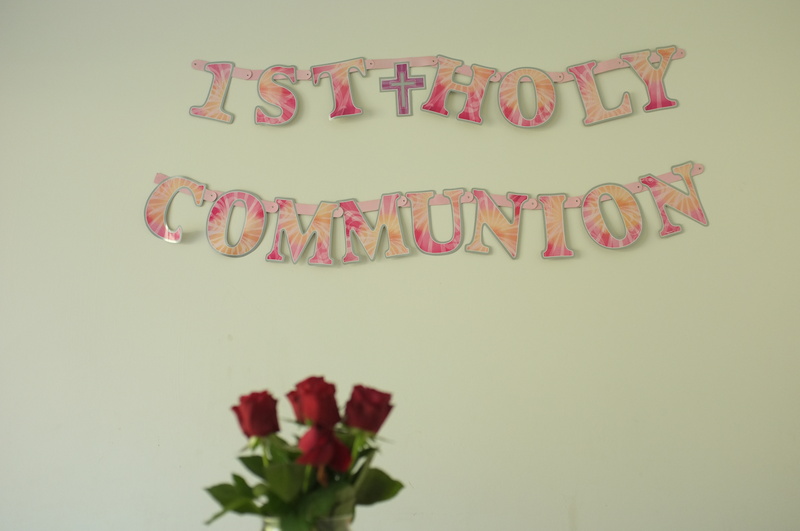 What memories do you have of your First Holy Communion, and if you have children who are communicants did you start, or carry on any traditions with them? And what do you think about money as a gift for a child’s religious occasion? For, against, or don’t care either way? I remember the beauty of the Pro-Cathedral Dublin – a vastly different building to my little, tin Parish church. I remember being part of the offertory and carrying the ciborium – I was fascinated by the ‘gold-ness’ of it! I remember being carried down O’Connell Street, the Main Street of Dublin City on my fathers shoulders after the ceremony, and I remember the photo session and being ‘posed’ correctly with book and beads very much in the forefront! I don’t remember money playing a part in it all, nor do I remember the priest, homily, songs or the taste experience! I don’t remember if I even had any knowledge of the person of Jesus, the love of Jesus or even the presence of Jesus for that matter! But I know that knew a whole book full of prayers – I can recite most of them still! Did I have any knowledge of joining this amazing family? Did I link the Last Supper with my family meal times and ultimately the Eucharist? Did I have any knowledge that coming to Mass on Sunday has all the elements of a great party, celebrated with welcome, song, stories, food and fond farewell with the open armed invitation to return again soon? Did my parents even get this idea? My reaction to all of the above is to immerse myself in just living the love of Jesus, making every sacramental preparation moment, as exciting as possible for the children and their parents. Drawing our lives into the Mass and showing how we mirror the Mass and our lives, so we are Eucharistic people, always. Those are beautiful memories Sinead and what an amazing ministry you have! Like you, I didn’t have much idea of what the Mass was actually about at the time, didn’t get all that until I was finished high school and doing my own searching, but it was just a really special occasion that satisfied me deeply – I remember being so excited that all of my extended relatives were coming to my parish church for the first time with me and my parents and sister. I think that simple kind of witness, just being there or turning up, is important as well.